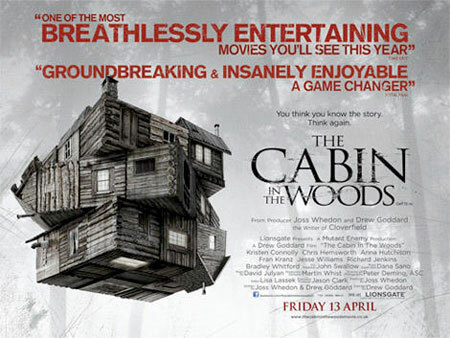 Here's a new UK quad poster for THE CABIN IN THE WOODS that will hit U.S. and UK theaters on Friday, April 13th. That's a good day for this cool looking flick to open isn't it! The Drew Goddard helmed / Joss whedon produced film stars Kristen Connolly, Fran Kranz, Anna Hutchison, Chris Hemsworth,Jesse Williams, Richard Jenkins,Bradley Whitford and I can't wait to see it!